What a way to come back to the blogging world! A huge thank you to Baby Bjorn for sponsoring this first contest and for giving such an incredible prize. The program used to select the winner is called Random Picker and each entry was put into this program and the computer program generates the winner. When I started the blog almost 4 years ago I was putting slips of paper into a hat, but we are way more legit now! A huge congratulations to our Winner- Joseph Wright! Joseph wrote that the person who is his "Power of Two" is his wife Regina. The project is already locked. Joseph, please email me your full address and Baby Bjorn will mail the carrier directly to your home! Thank you to everyone who took the time to read the entry, to enter the contest and to share your own "Power of Two" with me. 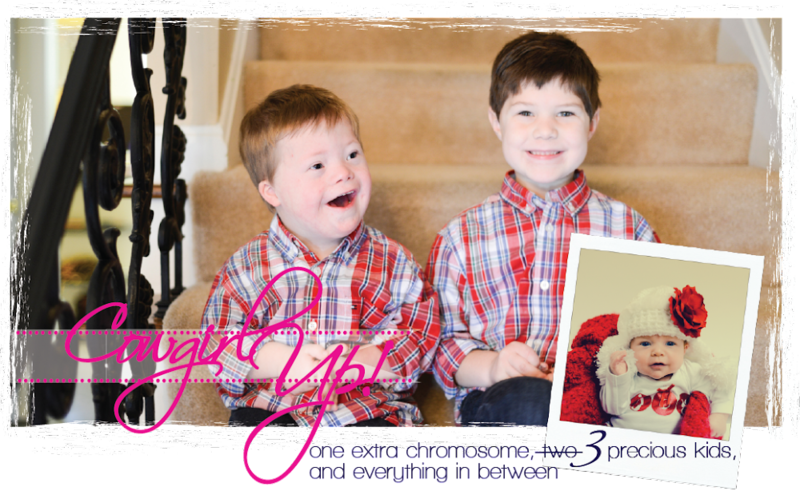 In just two weeks we will be celebrating 3/21, which in our world is World Down Syndrome Day. Part of celebrating World Down Syndrome Day is promoting Random Acts of Kindness. Maybe you can find an opportunity in the next two weeks to do a random act of kindness! Think about doing one in honor of someone you know who has Down syndrome. Coming up next on the blog are topics including, "Is There a Poltergeist In Our House?" and "Would You Move to a New School District for Your Child?". Thank you again to Baby Bjorn for this wonderful giveaway! If you are a child of the 80's/90's you may remember the Indigo Girls song "Power of Two". It always stood out in my mind because it was such a testament to how life's challenges are much more manageable when shared. When halved. The line in the song goes, "Multiply life by the power of two." I'm from a family of three siblings and Tom grew up in a family of five brothers. We had initially decided we would probably like three to four children of our own, but each pregnancy brought its own unique challenges. 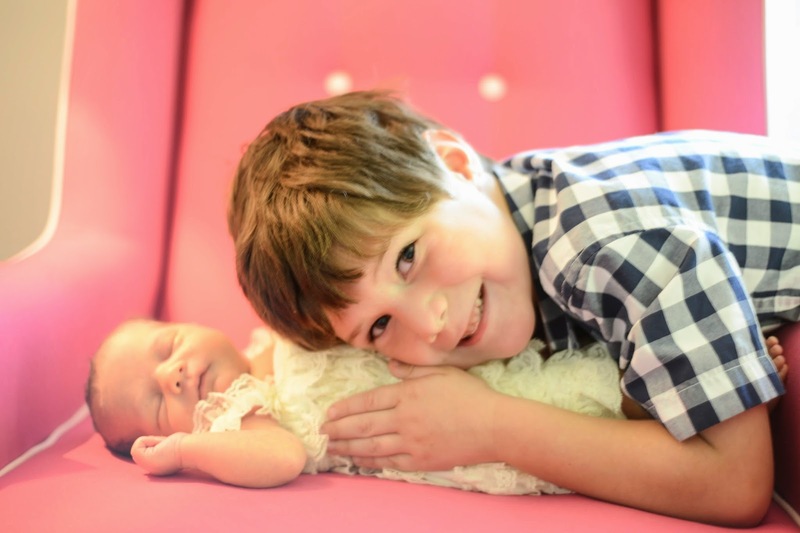 After Joey was born he required a lot of extra care and ultimately seven different surgeries. We wanted the kids to all be about two years apart, but life has its own way of working things out. At one point we thought we would wait until Joey started walking to try for one more baby. 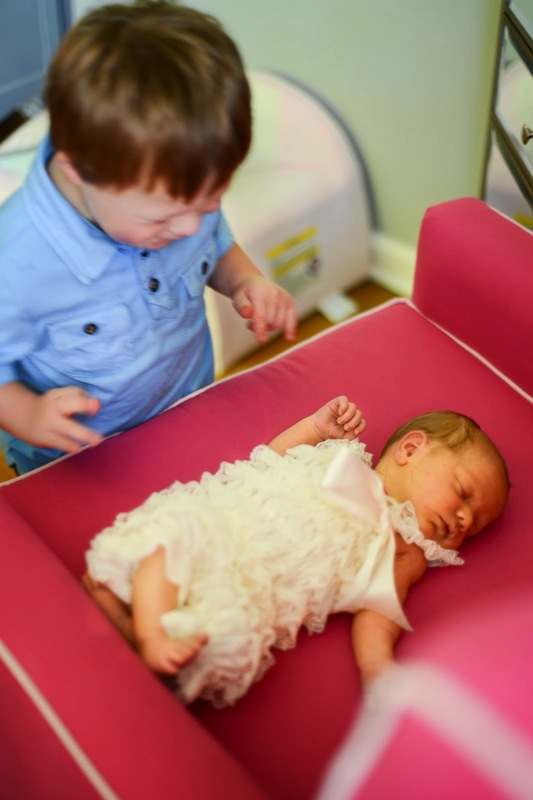 With amazing timing, Joey started walking right around when he turned 4 in August last year and the next month his baby sister, Lucille Evelyn was born. After Joey was born we questioned whether we had the energy and even the ability to have another child. He is an incredible and amazing little boy and to help him become the best person he can possibly be takes a lot of time and effort. There were many factors we thought about before trying for a third baby. We had lived in the world of children with disabilities and we now knew the reality of what can happen. We had spent nights in hospitals, hours in waiting rooms, minutes counting down the time until his next procedure would be over. What if another baby would also have a heart defect? Could we handle another pregnancy filled with endless doctors' appointments and ultrasounds? Could we do this all again? At the end of the day we just had to have faith that whatever would happen we would do our best no matter the circumstances. This is where the power of two came in. Part of having another baby was to provide another sibling to both Tommy and to Joey. A sibling to help Tommy some day when Tom and I are no longer around. A sibling who might just take a tiny bit of the attention away from Joey in a completely healthy way. 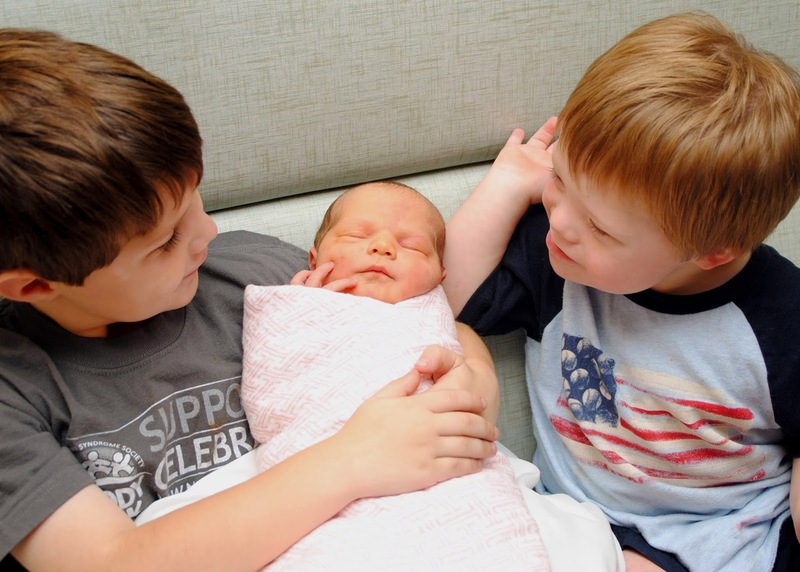 We thought a third child in our family would be wonderful for both boys. Someone to share the life decisions with Tommy and therefore multiply life by the power of two. Little Lucy is herself quite a tiny little fighter. I remember going into surgery for a ruptured appendix almost a year ago in April when I was pregnant with her. I asked one of the OR nurses, "You're going to monitor her during the surgery, right?" "No. This is an emergency surgery. We will check her before and after." And then I was out as the anesthesia kicked in. I will never forget that moment nor the two days leading up to it when I thought surely that if I was having so much pain it must be that I was losing the baby. Miraculously, she was fine through it all. Through surgery, CAT scans, MRI's, crazy doses of pain medication and antibiotics- she was fine. We are one grateful, grateful family. So! Life with three kids. WOW! It is a lot, but it's amazing. We haven't really slowed down for a minute. Some days I wish we would so I could clean up the house more and be more on top of things, but since the day Lucy arrived it has been non-stop action. So much so, that she is now 5 months old and I am finally back to blogging. I'm super excited about being back because part of the big comeback is a new header on the blog featuring all three kids- photos are by the talented Nat. The new header design is by the Little Blue Deer Design. The owner over at Little Blue, Shari, is a delight to work with and I love her designs. The other super, super exciting thing is that with this first post back I am offering a FREE GIVEAWAY of the latest and greatest Baby Bjorn Baby Carrier One! Our wonderful friends at Baby Bjorn contacted me and to win your own Baby Bjorn Baby Carrier One, all you need to do is to leave a comment in the comments section sometime during the next 5 days and we will have a random drawing for a winner! For us, part of being able to be on the go with the kids is being able to carry them with the Baby Bjorn. I have not one, but two Baby Bjorn carriers that I used with the boys and mine are at least 6 years old. Have things changed! The new Baby Carrier One can work as a front or back baby carrier. It also has cushioning in the waist band and instead of putting your arms through it like the old ones it fits over your head. The first time I tried it I did not even read the directions and I threw it in the car with me and Lucy as we raced down to run Buddy Up Tennis. What is Buddy Up Tennis? It's an awesome adaptive tennis program for people ages 5 and up who have Down syndrome. It is one of the main volunteer activities I have made a priority to keep participating in even though it is nuts with three little ones. I am so, so passionate about fitness for individuals with Down syndrome and for the opportunity for people with Down syndrome to have a variety of social and active opportunities, so this is the one thing I have committed to making happen no matter how difficult it might be at times to stay organized and to get to. If you are interested in your child participating in Buddy Up Tennis, or if you would like to volunteer, please send me an email at akron@buddyuptennis.com. I am the Athlete Coordinator for the Akron Chapter and we love all our athletes and our volunteers. Not reading the directions for the new Baby Bjorn carrier was not my best idea, but with the help of a couple of moms who were also at Buddy Up Tennis, we were able to figure it all out and Lucy was quickly facing out and watching all of the action in no time. The updated version also has the option of a baby cover, which actually clips onto the Baby Bjorn. This is great because my old method was just stuffing a blanket into the front of it. I honestly did not think that there was much that Baby Bjorn could have done to improve on the carrier, but they really have. I'm so, so excited for this opportunity to give one away to a Cowgirl Up reader! These are valued at over $150 and they are awesome. We actually use a number of the Baby Bjorn products and they are such great quality. We have one of their stools in each bathroom for the kids. We have one of their potty chairs (that's going to be our next major adventure with Super Joe) and one of their baby seats and Lucy loves bouncing in it an playing with the little wooden toys. I'm so excited and so honored to share their great products with all our readers and can't wait to see who wins one! Who do you turn to when you need to multiply life by the power of two? 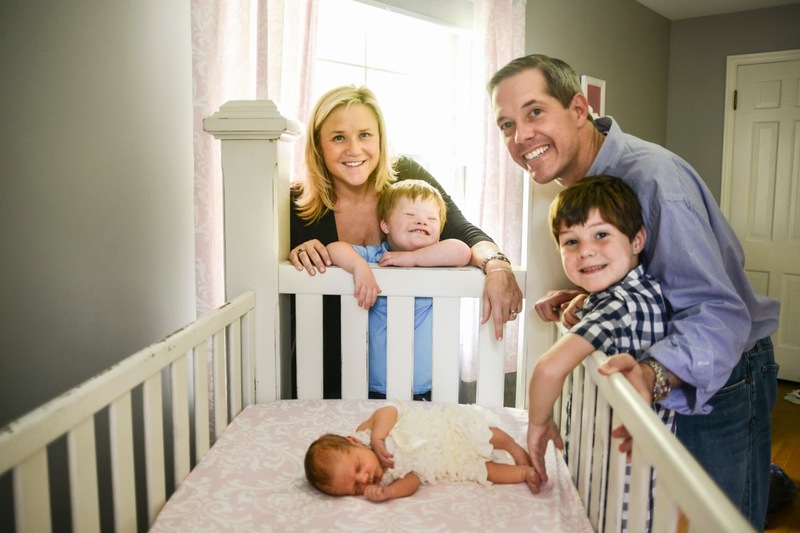 What Happens to a Young Boy Who Has Down Syndrome When His Pregnant Mom's Appendix Bursts? Maybe this has happened to you before. You are on auto-pilot. Your life is so scheduled down to the very last minute of every day that you often find yourself wishing for more time, more sleep, more energy- anything that would help propel you through another day. We had just announced that we were pregnant with our third child. I was 13 weeks along, teaching spinning classes 3 times a week, playing tennis, taking barre classes, working part-time, volunteering on multiple boards and raising two young boys. I had also been working at a feverish pace as a co-chair for a Down syndrome fundraiser that was going to take place on World Down Syndrome Day- March 21, 2014. This is shortly after we told the boys about the baby and a week or two before I got sick. When I say raising two young boys I mean that Tommy was in Pre-K five days a week and Joey was going to two different preschools on opposite ends of town. In addition to preschool we were also keeping up Joey's very intense therapy schedule consisting of Physical Therapy at the hospital on Mondays, Speech Therapy on Tuesdays, Occupational Therapy on Wednesdays, Horse Therapy on Thursdays and Music Therapy on Fridays. At the time I wondered how in the world we would keep up this pace throughout a third pregnancy, but we just keep plowing through day to day. As of March, Joey was walking only with the aid of his walker and very short distances, so there was a lot of picking him up and getting him in and out of the car. Some days I would be lifting his 36 pound body up and down from the car 7 or 8 times. The first crack in the armor was the morning after the big World Down Syndrome Day 70's Party I had co-chaired. (By the way- I still am not sure I ever adequately thanked every single amazing person who helped set up, helped procure auction items, who donated items and who attended the party - I am sure I still owe many people thank yous and I hope each know how amazing they are from their incredible donations to their help with making the decor and party incredible!!!). The day of the event I remember not sitting down once and barely eating or drinking from 1pm until about 1am when we were cleaning up. I thought I would collapse into a deep sleep when we finally returned home, but instead I was up all night with my heart racing and my stomach killing me. At 5am I drove myself to the ER so Tom could stay with the boys. After a long day of testing and trying to find the baby's heartbeat (FINALLY found it!!!) the doctor pumped me full of fluids and said I need to rest and not overdo it anymore. Ironically, the man in the room next door was being wheeled out of the ER and I overheard the doctor tell him they would be removing his appendix. "Whew!" I thought to myself. At least it wasn't my appendix. The rest of the weekend was spent in bed and I thought I was getting better and I vowed to try and slow down and take some things off the calendar for the rest of the pregnancy. The rest of March and into April is a bit of a blur. Looking back now I think I was probably getting sick all along. I remember that at least once a week I had to ask for help getting Joey to and from Therapy because I just didn't feel well. At the time I thought it must just be pregnancy related. I thought I would perk up and feel better once we got further into the second trimester. Not that the pregnancy was secondary, but when you have two young children and one who has special needs- pregnancy kind of takes a back seat. There are meals to make, clothes to wash, backpacks to organize, bills to pay, work to be done. You know- there's just life that goes on. It's taken me months to blog about what happened next. For months- literally months, I was catching up on everything. It was so strange not to write and not to describe Joey's journey for almost 6 months, but I could barely get the day to day things done.Looking back it is still so surreal. I hope that if this happens to another mom that she can find some comfort in our journey and see the many silver linings that can happen when life takes an unexpected turn for the worse. Tuesday, April 15th we went to Columbus with some of our best friends and Tom's twin to see Bruce Springsteen perform. It was an awesome day. We had dinner at our favorite Deli- Katzinger's in German Village. The concert started almost exactly on time and The Boss delivered a stellar show! We danced in our seats for almost 3 hours straight while we rocked out to the Boss and The E Street Band. The next morning I woke up not feeling very well, but I thought it must have been the late night out and lack of sleep from getting home around 1 am. Joey didn't have school that Wednesday the 16th, so I took him with me to my weekly tennis clinic. At this point there was a dull aching pain in my middle left side of my stomach, but I brushed it off as typical pregnancy pains or as something I must have eaten the night before. (Ironically I was incredibly grateful that it wasn't my favorite toasted challah/turkey/cheese/hot mustard sandwich from Katzinger's that was causing all the pain at the end of the day). About an hour into the tennis clinic the pain started to get worse. Something was off. I just didn't feel well. I told the pro and my friends that I thought I should probably go into my doctor and quit playing early. I picked up Joey from the playroom and we headed over to the OBGYN office. At this point carrying him and putting him in his stroller was suddenly seeming very overwhelming and difficult as the pain increased. I saw my OBGGYN and the nurse and they took one look at my green face and said it must be the stomach flu that was going around. I left with the office with a prescription for Zofran in hand. I called Tom on the way home and told him that I had to go to bed and needed help with Joey and with getting the medicine. He picked up the medicine and came home to take care of Joey until a babysitter could come help me. As the day progressed the pain got worse and worse. It seemed to move slowly from my left abdomen to all over my abdomen. It started to be much more central and radiated across my entire stomach. I just kept thinking that this was unlike any flu I had experienced before. I remember being in bed all day trying to get comfortable. Trying to make myself fall asleep. but it was impossible. Despite the Zofran I was vomiting and getting sick. That night was the worst part. I could not sleep at all and the pain was radiating all across my stomach. I spent most of the night on all fours trying to get comfortable and wondering- just wondering if maybe this wasn't the stomach flu, but maybe this was a miscarriage. Was I losing the baby? How could the baby survive this? It seemed unlikely that she could make it through this much intense pain for this long. The next day, April 17, I got out of bed and helped Tom get the boys ready for school. What I have now read is that if you don't catch what is going on with an appendix following the first 24 hours of surgery, there is an 80% chance the appendix will burst. About an hour later I was back on the ground on all fours trying to get off the ground so I could get to the bathroom to throw up. That's when I finally called Tom and said I think we needed to go to the hospital. At this point the pain had intensified and was piercing, sharp and unrelenting. It was now on my right middle side. Tom came home to pick me up and he had to almost carry me to the car. It was one of the longest and most painful car rides of my life. Every tiny bump, every turn felt like a knife in my right side. I could not for the life of me figure out how I would make it much longer with this kind of intense pain. The rest of the day was spent in the OB triage/ER at the hospital. The first thing they did was a high level ultrasound and I cannot describe the relief and joy I felt when we saw that baby girl's heart was beating and she did not appear to be in any distress. My worst fears were over - for the time being. Baby girl was doing well. Now was the hard part- trying to get a diagnosis of what was happening to me. Never in a million years did I imagine something was wrong with my appendix. It just never even occurred to me. According to the ER physicians, appendicitis and pregnancy is not at all uncommon. That being said, I had never in my life heard of someone who was pregnant suffer from it. That also being said- there is such a thing as being too tough and being too stoic. We were in the ER and getting testing for almost 12 hours before I shed a single tear. I was thirsty, hungry, in pain and scared. Scared to death. What in the hell was going on? There was one resident who mentioned the appendix and he seemed to feel pretty confident about it. At this point there was a disagreement with the OB team and the radiology team. The OB team wanted a CT Scan done immediately (well- about 6 hours after arriving in the ER), but the radiology team refused and said that I first had to have an MRI done because of the risk of the CT Scan to the baby. Around noon we called my parents to tell them what was going on and that afternoon they started driving up to Akron from Dayton. At this point I still had not been given any food, water or pain medicine and the pain was only getting worse. Being wheeled into the MRI room and then having to climb up on the MRI table was like climbing Mt. Ranier. The following 45 minutes was at the time some of the most painful and uncomfortable 45 minutes of my life. The tech kept telling me to hold my breath for what felt like a lifetime and then release it and stay completely still. The problem was the pain was only getting stronger and stronger and trying to hold my breath and stay still was excruciating. I finally told him after 45 minutes that I couldn't do it any longer. The pain was too much. At this point they took me out and I was rolled back up to the ER. Then the doctor came in with bad news. My uterus was shadowing my appendix on the MRI and they couldn't read the MRI. I would now have to go back down for a CT Scan. We were nearing 5pm at this point. I truly thought I might die from all the pain. This was the first time I finally cried. The pain was getting far too intense. Here is something to note- if you cry- you might actually get some pain medicine! Finally, after two days of increasing pain, someone took mercy and gave me some morphine so I could get through the CT Scan. The CT Scan was more of the same nightmare. Crawling out of the hospital bed- trying to get on the CT table. The excruciating pain that was barely touched by the morphine (again- if this ever happens to you- and I hope it doesn't- ask for pain medicine early on!!!) and trying to lie still. After making it through the CT Scan, things started finally moving quicker. It was almost 6pm when the resident and attending came back to our OB Triage room and told us that they believed I had an appendicitis. We were given two options- one was to try to and treat it with antibiotics for 24 hours and the other was surgery. Everyone in the room agreed that surgery was the most viable option at this point. Around the same time and it was decided the surgery was going to happen my parents and Tom's mom arrived at the hospital and I was able to quickly say hello to everyone and then have a moment alone with Tom before surgery. The only problem now was that the surgery team was gone for the day and they needed to call everyone back to the hospital, so by the time we had our diagnosis and surgeon it was almost 8pm at night. Part of the reason we felt surgery was the only option was by this point the pain was excruciating. It was not stopping and was only increasing. I asked the doctors if they would be monitoring the baby during the surgery. Their response was, "No. We will monitor the baby before and after the surgery, but not during. This is considered emergency surgery." Oh. Okay. Not what I wanted to hear. What about the pain? "Surgery will definitely make the pain go away." Famous last words. The plan was to go in laproscopically and remove the appendix. The surgical and medical team believed that the appendix was still intact and would have a good chance of being removed. I remember being wheeled yet again around the hospital, only this time it was up to the Operating Room where we ran into a slight SNAFU. I had come into the hospital wearing a pair of oversized pajama bottoms, no underwear and a tank top and wrap top. Throughout the entire day in the ER I was in too much pain to change into a hospital gown. It was only when I was on the operating table that they realized I was still in my pajamas. One of my last memories before surgery was struggling through intense pain to take my clothes off in a freezing room full of strangers. The very last memory was when they put the mask over my mouth and nose and the room went dark. A couple of hours later I woke up in recovery and found out that they had tried to remove the appendix laproscopically, but once the surgeon was in the site, they found that the appendix was necrotic and had ruptured. Because it had ruptured they had to go in at the site of the appendix and instead of waking up with one scar I woke up with both a 2-inch laproscopic scar below my chest and a 7-8 inch surgical incision in my mid-right abdomen. Soon I was in a hospital room on the Maternity Floor that would become my new home for the next ten days. The day after surgery was Good Friday and all I could think about was what would we do for the boys for Easter and would they get their Easter Baskets and egg hunt without me. The original plan was only to be in the hospital for a few days, however as I woke up and the pain medicine from surgery wore off I realized that the pain that was supposed to disappear with surgery was still exactly where it was when I had gone into surgery. What was going on? Was this just the recovery from the surgery? Would it really hurt this much? I was allowed some painkillers that are supposed to be allowed while pregnant, but every single time I took another pill I worried more and more about what I was doing to my baby. I couldn't get over the fact I had undergone surgery the night before. My family and the nurses encouraged me to do the breathing treatments and to get up and walk as soon as possible so I would not get an infection or pneumonia in my lungs. I wanted so badly to walk. I wanted so badly be better, but I could not for the life of me explain the amount of pain I was still in. I spent Easter weekend curled up in the fetal position in a hospital bed trying to cope the incredible amount of pain that still existed. On Easter Sunday the person who delivered meals dropped off dinner at 3pm and said she was going home because it was Easter. It didn't matter. I had no appetite. I didn't want to eat anything anyways. I will say, the hospital is a lonely place on a holiday weekend. The bizarre part was that I had spent the night in various hospitals over the past four years, but it was always with Joey who gave a me a purpose and a reason to be in the hospital with him. This time it was just me. My parents had stayed in town and had been taking care of the boys since the surgery. When it was time for them to go home, our sister-in-law and brother-in-law from New Jersey and Tom's mom helped stay with the boys for a couple of days. It would only be 48 hours until my mom would end up turning back around coming this time instead of for 4 days, for 30 days to help us get through the hardest parts of what was to come. The Monday after surgery I was finally going to get a chance to shower. It had now been almost 7 days since I had washed my hair. I briefly got to see the boys on Easter afternoon and I know that my greasy hair and unwashed face had to scare them. Tom helped me into the shower so I wouldn't pass out. At this point, 4 days after surgery, the intense pain had only increased and I had yet to feel the relief I was promised following surgery. It felt so wonderful to wash and rinse my hair, but half way through the shower I asked Tom if someone had pooped in the shower. Disgusting, right? I thought for sure that someone had used the shower before me as a toilet. Instead I looked down at my large bandaged surgical site and realized that I was leaking brown and orange fluid out of it. It reeked. I cannot begin to tell you what the smell of infection is like coming out of your own body. I was so revolted I thought I was going to vomit in the shower. We quickly called the nurse and soon she was there examining the site. Over the next 24 hours the skin from my mid-stomach all the way around to my middle back was turning red. Whatever was inside me was spreading quickly and painfully. Again, I wondered how our baby girl was surviving this bizarre sickness? The following days were a nightmare. The first thing that happened was that the surgical resident came to my room and decided to partially re-open the surgical site that was stitched closed. This was an 8 inch gash across my mid-belly. Without any lidocaine or any sort of numbing, she tore out half of my stitches and re-opened half of my surgical incision. It was at this point that the pain hit an all time high and I started suffering intense anxiety anytime someone would come in the room to touch or examine my incision. The point of re-opening the incision we were told was to try and help drain the infection. Twenty-four hours of more pain and discomfort went by. My mom returned when I sent her the photos of the infection spreading. The nurse in her knew that something was not right. Friends and family were feeding and taking care of the kids. When my mom came back she became their mom and made them breakfast, packed lunches, took them to school, took Joey to therapy and stayed with me during the day at the hospital. What we thought would be 3 days in the hospital was getting longer and longer. When it was all over she ended up staying for 30 days. The day after the surgical resident partially opened the incision, the infection was spreading. Almost my entire midsection was red from front to back. This time the resident brought lidocaine and numbed the area before ripping out the remaining stitches. From that point forward I had to have what was once an incision, but was now considered a wound, opened and re-packed in twice a day dressing changes for almost 35 days. The weird part was I kept thinking that the worst of it all must be behind me, but that wasn't what was happening. Each day there was a new, unique form of torture in this insane effort to recover from having my appendix burst while being 17 weeks pregnant. I don't know what I expected, but although the surgery team re-opened the incision, I guess I thought at some point they would re-close the 8 inch gash that was 2-3 inches deep before we would eventually leave the hospital. That did not happen. The pain was still there and during the vitals checks each day I would rate the pain an 8, 9 or 10 on a scale of 1 to 10. I remember one of the nurses asking me what it would take to reduce the pain- I told her I had no idea. I was just praying that eventually it would get better. What we would learn over the next few days was that the pain had never left because the appendix had ruptured and there were two abscesses that had formed inside my body near the surgical site. Have you ever had a sinus infection? Or strep throat? You know that insane pain in your head and throat that just burns? That is what this was like, but 20 times worse because the infection was inside my body and had been there for almost a week at this point. After the surgical resident re-opened the incision the entire way I had to chug down a ton of barium sulfate. Then I was wheeled back down to radiology (how many CT's and MRI's had I had at this point? 5? 6? I couldn't keep track). This was when they discovered the two abscesses of infection. One was extremely close to the womb and one was right near the surgical site. An infectious disease doctor had now joined our team and it was decided that I needed to be put on IV antibiotics to try and kill the abscess near the womb because it was too dangerous to try and drain it. For the other abscess I was scheduled to get a drain tube inserted the following day to try and get rid of the infection. That afternoon a special "port' team came to my room to put an IV Port in my right arm to receive the IV antibiotics. They were going to be too strong for the IV in my hand and would be much longer term than expected. Over and over I was assured that the pain meds, the anesthesia, the antibiotics were all considered as safe "as possible" for the baby- but none of it comforted me. I still can't imagine what all of this was doing to our precious little one. I could feel the drugs pumped into my arm every day- multiple times a day. One week after the surgery I was taken down to radiology again and they first tried to use an ultrasound to place the drain tube. Unfortunately, the uterus was in the way and they decided it needed to be done via a CT Scan. This was all fine and well, but here we were exposing the baby to yet another CT Scan and on top of it- I was awake and lying half in and half out of the CT Scan with an 8 inch open wound while the radiologist took a 12 inch long metal stick and had to pierce my stomach with it multiple times until we hit gold and found the abscess. I have been awake for two other C-Sections, but this was by far the worst and most painful and scariest procedure I have ever gone through. The sensation of them poking and watching the long metal rod go through my stomach was completely surreal. The minute they finally hit the abscess I knew it immediately because I could smell the infection. Yes- I could smell the infection. It smelled exactly like what was seeping out of my wound 3 days earlier in the shower. I knew they had hit the mark. In the meantime, without my knowledge, one of the drugs they gave my through my IV was Phenergan. While Phenergan is supposed to treat nausea and pain after surgery it has the exact opposite effect on me. I had it after I gave birth to Joey and vomited for almost an hour. Sure enough it was happening again. As soon as I made it through the procedure and was back in my hospital room I started vomiting again, which is painful enough when you are pregnant, but imagine violently vomiting with a new drain tube in your body and open 8 inch surgical incision. It was insanity. Would it ever get better? It didn't seem like it at the time. I had not cried once during the entire time in the hospital other than the night of surgery when I was finally so exhausted, scared and hurting. The second time happened 8 days in. The Infectious Disease doctor visited the day after the drain tube debacle to tell me that when it was time to go home he wanted to put me on a 30 day course of IV antibiotics to help make sure the infection was killed in both abscesses. When he left the room I finally cried again. I already felt like I was missing so much at home with the kids. How were they doing? I only saw them once the entire 10 days in the hospital because I was so sick every day that we didn't want to scare them. Now when I would finally be going home I would have to get IV antibiotics for a month? I had a drain tube in? I had an open wound where there was once a surgical incision? How did this happen? How would we make it? I think it was at this point that it was finally dawning on me that the surgical incision was not going to ever be sewn shut again. I was realizing that I would be going home with this open, gaping wound that needed dressing changes twice a day. It was as though we were living in the 1800's. Who goes home from the hospital with an open wound? The idea of another 30 days of super-strong antibiotics also seemed impossible. It all seemed so strange and so surreal. Like it was happening to someone else. Once the doctors found the infection and started to treat it, the intense stabbing pain had started to slow down, but now in its place was a new pain to deal with. The pain of an open wound on my abdomen while being pregnant and having an ever-expanding stomach. The surgical incision had now become an open wound. After 10 days in the hospital, our team wanted us to stay longer, but we said we really wanted to go home. I was not getting any rest in the hospital with the constant vital checks, the wound dressings, the IV's. It was time to go home and try to get better. While we were in the hospital, my mom was managing our home and the kids and making sure they were all taken care of. Because she was taking such good care of the children, Tom was able to spend every single night with me in the hospital, which was an incredible blessing. I was still unable to get in and out of bed or to the bathroom by myself. The wound was slowly healing. Tom had to learn how to give me the medicine. For weeks after we were discharged I was unable to get to the bathroom by myself or get out of bed. I was so sore from the open incision that I literally could not even pull the sheets up by myself. I remember when we finally got home from the hospital, Tommy wanted to pull the drain tube out because it upset him. At one point he looked at me and asked, "Are you faking it, Mommy?" "Oh, Tommy, I wish I were faking it." "That would be a lot better, wouldn't it Mommy?" he responded. The next day he showed me a picture of me holding Joey and laughing. He said to me, "I want that Mommy back." Tommy was breaking my heart. Finally home with the boys! That was probably the worst part of being sick. It took away all my energy and all my ability to be the mom I want to be. From April 17th until today I have still not been allowed to pick up Joey. The surgeon did not want my incision to herniate or re-open. Eventually, after 3 week at home my mom helped me get a wound vac that would finally help close the wound. We were working against time, like in one of those action movies where the entire plot revolves around trying to get the bomb to not detonate before the end of the movie. We were trying madly to get the wound to close before my stomach got much bigger. The Wound Vac. It hurt, but it worked! I have had to rely on my mom, Tom and babysitters to drive the boys to school, take them to activities, take Joey to therapy. For the first few months I couldn't even be alone in the house with Joey in case anything happened because I had no ability to take care of him in case of an emergency. I wondered how, just how, would these beautiful boys make it another five months with their mom not being able to all the things she normally would do. I was so frustrated, so down, so depressed so many times this summer when I couldn't just throw the kids in the car and take them to the pool or the park or the ice cream shop on a whim. We would be invited to go places or on play dates, but I always had to have a babysitter with me to help me get Joey in and out of the car. For the entire summer we had a wonderful helper/babysitter who drove around with me. We carefully scheduled every week and every therapy appointment. We coordinated every swim lesson, every camp drop off and pick up and everything in between. For being someone who was used to be so capable and so able to do whatever she wanted, I suddenly had much more empathy for people who have a physical disability or elderly people who may move more slowly. Looking back now, there have definitely been silver linings. Back in April I just could not imagine what Joey would do without me being able to pick him up for 5 more months. Then I knew that this baby would be a third c-section (again- don't want the incision site to herniate with labor) and that I still wouldn't be allowed to pick him up for at least another 6-8 week. With the help of some amazing people at Summit DD, we found an incredible summer camp program for him at Kids Country in Fairlawn. Joey was with all typical kids every day from 9 am until 1 pm and then he did his daily therapy sessions in the afternoons. This is where the silver linings come in. This where you see miracles in every day life. Slowly, but surely, our Super Joe has started to walk. He turned 4 on August 27th and I can say without hesitation that at home he is now walking more than he is crawling. He is getting there and it has been one of the silver linings of this entire adventure. He has gained so much physical and verbal independence. It's been incredible to watch. The first few weeks home from the hospital were tough because he would hold his arms up and I would have to tell him that Mommy has a boo boo and can't pick him up. He was acting out at school and at therapy. Slowly, but surely he started to understand and from there we have just been watching his independence and confidence grow and blossom every day. I know we didn't get to the pool or get to do as many outdoor activities as we would have liked to this summer, but Tommy also seems to have survived as well. He started Kindergarten and loves school, which is all we can ask for. Tommy is an incredible big brother to Joey and he enjoyed having a month to have Grammy make him omelettes every day and take care of him. That was another silver lining to everything. Because my parents live 3 hours away we don't get to see them as much as we would like, but the month my mom stayed with us the boys got to know her so well and they have such a special relationship because of everything that happened. She took care of them (and me! she changed my wound twice a day and gave me my IV medicine when I couldn't take any more home health nurses coming and going!) day in and day out and my dad came every weekend to see her and us. I still feel like I haven't completely caught up on everything. I tried to send thank yous to every single amazing person who so kindly brought a meal, or drove the kids or visited or stopped by for coffee, but I'm sure I've missed a few. One of the hardest parts was not only accepting help, but asking for help. For the incredible help we received we are so very grateful and blessed. For my mom who was my nurse and advocate and who also fed, clothed, and took care of the kids- I don't know how we will ever thank you enough. Now we are turning our focus to this amazing little girl who is coming into this world tomorrow morning via a C-Section at 11:30 am. This has been an interesting year. Since my surgery we also lost Tom's father after a long summer of watching his health steadily decline. Joey was in the ER with an upper respiratory virus in July that he finally was able to get over. At the beginning August I ended up in the ER with trouble breathing and was diagnosed with the H1N1 swine flu. Two weeks later I was back in the ER with severe dehydration and contractions because I had caught the stomach flu. Oh the worries I have had. Will she be okay? How did all the trauma and medicine effect her? I try to push the worries aside and focus on continuing to hold onto the faith that has gotten us all through this. I had these same worries about a precious little boy who has Down syndrome. I worried about how Joey would get along without his Mom to pick him up and carry him along the way to every appointment and every therapy. What would happen to Joey when my appendix burst and I could no longer be his main caregiver? I will tell you what happened. He flourished. He thrived. He excelled. He gained independence. He is becoming such a big boy. As with so many things I have worried about in life- this too has turned out far better than we ever thought it would. I can't believe the time has finally come. A third baby. A little girl. For all the pain and all the heartache and all the suffering, we are so very blessed. To everyone who helped us get here we thank you for your kind words and love and support and encouragement. This has been a year like no other. 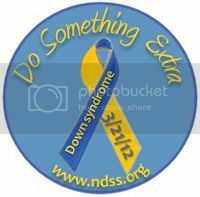 Do Something Extra this World Down Syndrome Day! Brian and Katie Washington D.C.
All content including pictures in this blog are copyrighted under Copyright and intellectual property laws. In other words: You may not copy or distribute or use my personal pictures in any way without my permission.